I coloured her in with my copics and used a rounded stitched die to cut her out. I melted some shabby white frantage around the image and added some star sequins in white and gold. I also applied wink of stella to her wings for some sparkle but it is always so hard to see in the photo. I chose two papers from the digital kit and inked the edges with some desert sand ink. I love the papers in this digital kit, and I can't believe I have never used them before even though I bought this kit over a year ago! I adhered them to my card base and added a piece of ribbon along the join. I also added some fresh mint sequins as they complemented my paper perfectly. Our challenge this month is sponsored by Stamp and Create who are offering the winner a $20 voucher. I hope you can play along. oh WOW! what a completely gorrrrrrrrgeous card, absolutely lovely in all respects! thanks for shopping your stash with us at ♥JINGLE BELLES♥!!! Your fabulous coloring really brings her to life ... 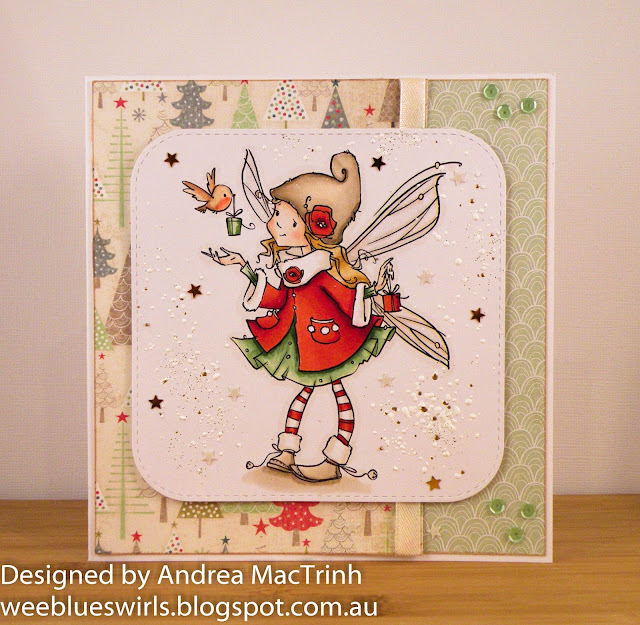 I love the texture you added to the background ... so very glad you shopped your stash with us at Jingle Belles. Thanks for entering our Christmas Card Challenge this week!